Flyball is believed to have begun in North America in the 1970's. It started when a Californian man by the name of Herbert Wagner developed the first tennis ball launcher for his ball crazy dog. After receiving positive feedback from demonstrations performed at his obedience club, he then gave a demonstration on the Tonight Show. Wagner's revolutionary idea was then introduced into Toronto and Detroit, and after a few small competitions the first formal competition was held in 1981. This later resulted in the North American Flyball Association was founded in 1984. 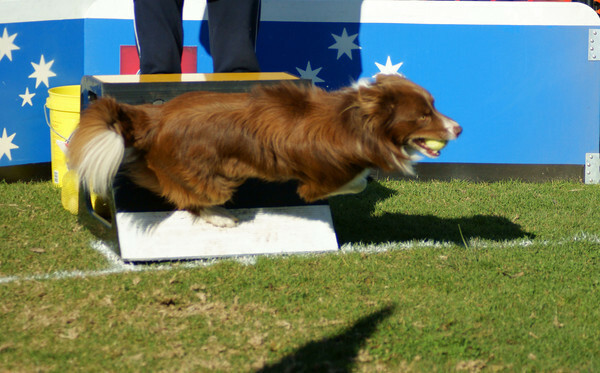 The earliest known Australian flyball activity was in 1982 in Perth (Western Australia). Flyball was a demonstration-only activity until 1996, when the Australian Flyball Association (AFA) was formed. The AFA grew out of Queanbeyan in New South Wales, and race meetings rapidly spread from New South Wales to the Australian Capital Territory and Victoria. Queensland, South Australia and Western Australia have more recently held competitions. How Has Flyball Changed Over The Years? Flyball has changed dramatically over the years. For example, the first flyball boxes were arm-style boxes, with a cup to hold the ball on the end of a moving arm. After a while people became worried about dogs hurting themselves while jumping to catch the ball. This lead to swapping to boxes with enclosed moving parts, like the wedge box or curved front box. Jump heights have varied over the years, and in some early demonstrations all dogs had to jump 16 inches. Now, jump heights are set at 5 inches below the shoulder height of the smallest dog in the team. The advances in technology have resulted in sophisticated Electronic Judging Systems, judge starts and passes that previously had to be judged by people. Anyone who has watched good passes knows that deciding by eye whether passes are legal is not easy! The best times run by teams have decreased due to improved training methods and boxes. The first team to break the 20 second barrier in Australia was the Croydon Rocket Launchers in 1999. At that time, the world record was just over 16 secs. The Australian record is held by Norwest Thunderdogs at 16.413 secs.